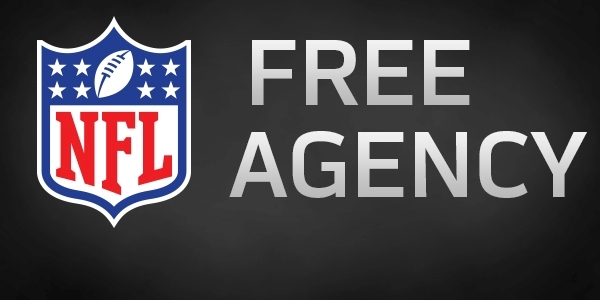 March 10th was the official start of the 2015/2016 NFL season, which means free agency has started and teams are officially able to sign free agents to their teams and they haven’t wasted any time. Some big name players already agreed to terms with teams before free agency began but weren’t able to make it official until today. Ndamukong Suh: Suh was arguably the best free agent on the market this year and the best free agent that has been available the past few seasons. The Detroit Lions decided not to use their franchise tag on Suh making him a free agent. Using the tag on Suh would’ve cost the Lions $26.9 million in 2015. Suh officially signed with the Miami Dolphins on Tuesday. Suh signed a six-year deal worth around $114 million with $60 million of that deal being guaranteed. Jeremy Maclin: Maclin was the best available receiver on the market this year, Randall Cobb most likely would’ve been the most sought after receiver this year had he not re-signed with the Packers before free agency started. Maclin left the Philadelphia Eagles and signed with his old coach Andy Reid and the Kansas City Chiefs. The extent of the contract hasn’t been completely released yet but it is said to be around $11 million a year. Darrelle Revis: Revis just won a Super Bowl with the New England Patriots but the Patriots didn’t want to pick up his 2015 option worth around $25 million so they cut Revis with hopes of resigning him to a smaller contract. Instead of defending his Super Bowl with the Patriots, Revis decided to return to the New York Jets. Revis’ deal is a five-year worth $70 million. Mike Iupati: The best guard on the free agent market and one of the best offensive linemen on the market this year. Iupati decided to leave the 49ers but not leave the division. Iupati agreed on a deal with the division rival Arizona Cardinals. The deal is a five-year deal worth around $40 million with $22.5 million guaranteed. The $8 million dollar average makes Iupati the highest paid offensive lineman on the Cardinals. Julius Thomas: There is no question Julius Thomas was the top free agent on the market this year at his position. Thomas made the decision to ditch Peyton Manning and the Broncos to sign with Blake Bortles and the Jacksonville Jaguars. Thomas hasn’t officially signed with the Jaguars yet but when he does it is expected to be worth $20.5 million with $8 million guaranteed. Frank Gore: With Murray not biting on any teams yet many other teams went after Gore to solidify their backfield. Gore first agreed to a deal with the Philadelphia Eagles before free agency began but in the past days he had second thoughts. Gore made his final decision and signed with the Indianapolis Colts, a move that will benefit the Colts greatly as they haven’t had a solid back with Andrew Luck under center. Gore’s deal was reported to be a three-year $12 million deal. Byron Maxwell: In a free agent market with many top cornerbacks available, Maxwell seemed to be the one everyone had their eyes on. Maxwell played extremely well opposite of Richard Sherman last year. Despite the Seahawks historical run on defense, Maxwell decided to leave the Legion of Boom and sign with the Philadelphia Eagles. Maxwell’s deal with the Eagles is a six-year deal worth $60 million with $25 million being guaranteed. Torrey Smith: Smith has been a quiet producer for the Baltimore Ravens the past few seasons. Smith ultimately decided to sign with the San Francisco 49ers, a deal that will greatly help the 49ers replace the void left by Michael Crabtree who is most likely leave the Bay area. Smith’s deal is a five-year $40 million deal with $22 million guaranteed. Darnell Dockett: After being cut by the Arizona Cardinals, Dockett wasted no time in agreeing to a deal with the San Francisco 49ers. The 49ers offered a two-year $7.5 million deal with Dockett earning $4 million this season. The Cardinals declined to counter the 49ers offer with a deal of their own that would be similar to that. Jacoby Jones: Jones signed a two-year deal with the San Diego Chargers worth $2.5 million the first year and $3 million in 2016. Michael Oher: Oher signed a two-year $7 million deal with the Carolina Panthers. Todd Herremans: After 10 seasons with the Philadelphia Eagles, Herremans is leaving and signing with the Indianapolis Colts. Herremans deal hasn’t been specified yet. Brian Hoyer: After starting most of the year for the Cleveland Browns, Hoyer left the quarterback controversy in Cleveland and joined the quarterback controversy in Houston. Brian Hoyer and the Houston Texans agreed on a two-year $7 million deal. Ted Ginn Jr.: Ginn Jr. is leaving the Arizona Cardinals and returning to the Carolina Panthers on a two-year deal worth $4.2 million. Brian Hartline: Ohio native Hartline has agreed to a deal with the Cleveland Browns worth $6 million over a two-year span. Cary Williams: The Philadelphia Eagles cut cornerback Cary Williams who they later replaced by signing former Seahawks cornerback Byron Maxwell. The Seahawks wasted no time in replacing Byron Maxwell as they signed the former Eagle as his replacement. Williams agreed to join the Seahawks and the Legion of Boom for three-years worth $18 million. Trent Cole: If any Super Bowl contender needs help in the pass rush and on the edge the Indianapolis Colts certainly are on top. Colts are working to fix their problems on the defensive line and are going in the right direction by signing Cole. Shane Vereen: Vereen’s run with the New England Patriots is coming to an end as he has agreed to a deal with the New York Giants. Harry Douglas: Douglas has gotten quite a lot of time to prove himself when either Julio Jones or Roddy White were hurt in Atlanta and he’s finally cashing in. Douglas has agreed to a deal with the Tennessee Titans. The deal is reported to be over the span of three-years but no exact numbers have been specified. Tyvon Branch: Branch has decided to leave the Oakland Raiders but stay in the AFC West. Branch and the Kansas City Chiefs have agreed to a deal. The deal is only over the span of one-year. Pernell McPhee: McPhee is leaving the Ravens and signing a five-year contract worth almost $40 million with the Chicago Bears. James Carpenter: Carpenter’s time in Seattle is coming to an end as he has agreed to a deal with the New York Jets. Carpenter signed a four-year deal worth roughly $5 million a year. Jared Odrick: Odrick is leaving the Miami Dolphins but not the state of Florida. Odrick agreed to a deal with the Jacksonville Jaguars, the deal is reported to be worth $8.5 million a year with $22 million guaranteed. Dez Bryant: The Cowboys were in a tough situation, either use their franchise tag on DeMarco Murray or Dez Bryant. The Cowboys decided on Bryant and are hoping to re-sign Murray. Putting a tag on Bryant will pay him $12.8 million in 2015. Randall Cobb: The Packers weren’t going to let one of their best playmakers leave. Not only did the Packers make sure Cobb didn’t leave, they made sure he’s here to stay by re-signing him to a four-year $40 million contract. Stephen Gostkowski: Gostkowski is staying with the Patriots. The Patriots decided to use their franchise tag on Gostkowski. Justin Houston: The 2014 NFL sack leader isn’t going anywhere. The Kansas City Chiefs used their franchise tag to keep their pass rushing linebacker. Demaryius Thomas: A wide receiver as big as Thomas that can rack up the yards after catch that Thomas does are rare, few and far between and that’s exactly why the Denver Broncos used their franchise tag on Thomas. Devin McCourty: McCourty is staying with the New England Patriots after agreeing to a five-year $47.5 million deal. Brandon Flowers: Chargers were able to keep their elite cornerback by re-signing him to a four-year $36 million deal. Mark Ingram: The Saints signed back their leading rusher from last season and former Heisman winner Ingram. Jason Pierre-Paul: The New York Giants had all intentions of re-signing their star defensive end and when they couldn’t reach a agreed deal they used their franchise tag on him. Kiko Alonso and Lesean McCoy: The Bills and Eagles reached a deal where they would swap players Alonso and McCoy. Adding McCoy to their offense will only help the Bills as they continue to be one of the fastest rising NFL teams. Nick Foles and Sam Bradford: After re-signing quarterback Mark Sanchez, Chip Kelly and the Eagles shipped Foles to St. Louis for quarterback Sam Bradford. Draft picks were also exchanged in the trade. Seahawks and Jimmy Graham: This is the blockbuster trade of the offseason as the Seahawks receive pro-bowl tight end Jimmy Graham and a fourth-round draft pick for pro-bowl center Max Unger and the 31st overall pick in the 2015 draft. The Seahawks added a much needed weapon to their passing game but might have taken a hit in the running game by trading away their best lineman. Brandon Marshall and the Jets: The Jets received wide receiver Brandon Marshall from the Bears and the Bears 7th round draft pick. The Jets only had to give up their 5th round pick but are going to eat up the rest of Marshall’s contract. Haloti Ngata to the Detroit Lions: The Lions quickly found their replacement for Suh as they reached a deal with the Baltimore Ravens to receive Ngata in a trade for their fourth and fifth-round picks. Jake Locker: Tennessee Titans quarterback Jack Locker announced his retirement from the NFL at the age of 26. Locker said he no longer has the fire to play the sport of football has a job anymore. Patrick Willis: Willis announced his retirement from the NFL on Monday. Willis was at the top of his game but also had injury problems in the recent years. Willis’ announcement shocked the league; Willis later explained that his decision to retire was related to his injury issues.